Rapid warming is loosening our thin snowpack & will remain our concern in a variety of forms. Wet loose avalanche activity is the result of water percolating through the snow grains & destroying the bonds that unite the pack. Avalanche problems can be in the form of loose wet, wet slab, or cornice failure types. Afternoon travels can become hazardous when the sun & air temperatures are most intense. We are losing an average of 2" per day on our slopes exposing more environmental & route finding issues. There is a long ride on asphalt before you hit snow at 8500' from the Leavitt Falls Vista Gate. Friday & Saturday we will be having a Snowmobile Specific Avalanche Awareness Class in Gardnerville. We would like to see you there. Temperatures near 50F degrees cannot sustain a strong snowpack for very long. The rapid increase in wet instabilities is directly due to sun & warm air temperatures. Look for the more shaded aspects for the best snow, especially in the afternoon when the loose activity is most pronounced. 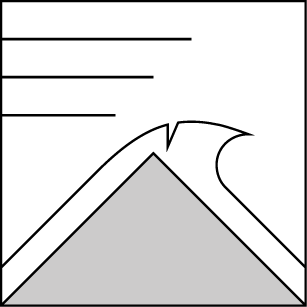 Relatively small in size, a loose wet avalanche can send you into a terrain trap, over a rock band or into the trees unwillingly. On ridgelines & some vertical terrain features, winds help create larger accumulations of snow on leeward aspects. When this develops a cornice, unsupported overhanging snow, the potential for this drift to fall & create a large avalanche is nearly inevitable. Cracks were easily seen in cornices yesterday, as wet snows have begun to creep along with gravity. Look up & take notice of dangers above you every time you ride. Weak layers remain within our snowpack where facets & surface hoar exist. As you dig a test pit look for layers that have poor resistance & are likely to just fall out of your snow pit walls. These grains do not support rapid weight changes well. What they do well is collapse & propagate avalanches. It may be hard to get a catastrophic failure but do not exclude this hazard from your decision making repertoire. Yesterdays pit revealed this problem to be 26cm (10") deep. 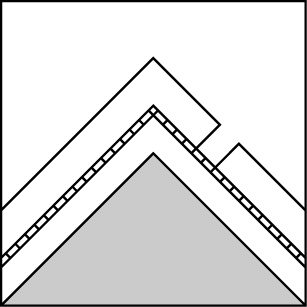 Cornices can have catastrophic failures from rapid melting & loosening of snow grains. Pictures from yesterdays observation clearly show South facing cornices are primed to break away from the ridgeline. Cornices can be a dramatic avalanche problem, especially when then they fall in an already loaded starting zone creating wet slab & loose wet avalanches. Pinwheels & rollerballs are putting a fine texture to our rapidly melting slopes & are a great indicator of wet instabilities. Creeks, rocks, asphalt & vegetation are melting out creating harsh riding conditions especially below 8500' elevation. Max. temperature in the last 24 hours: 50 deg. F.
Hot, dry & devoid of snow. At the rate of losing almost 2" of snow each day we are struggling to keep a snowpack near 8500'. Blocking High Pressure has consumed our region & any precipitation is going to the Northwest. Mount Baker is the place to be if you want deep pow right now, they are having a record January. Clouds tomorrow will help curtail some sublimation & melting. Temperatures: 50 - 56 deg. F. 29 - 34 deg. F. 46 - 54 deg. F.
Temperatures: 43 - 48 deg. F. 26 - 31 deg. F. 39 - 45 deg. F.